Keep reading to discover the modern silhouettes of the season. 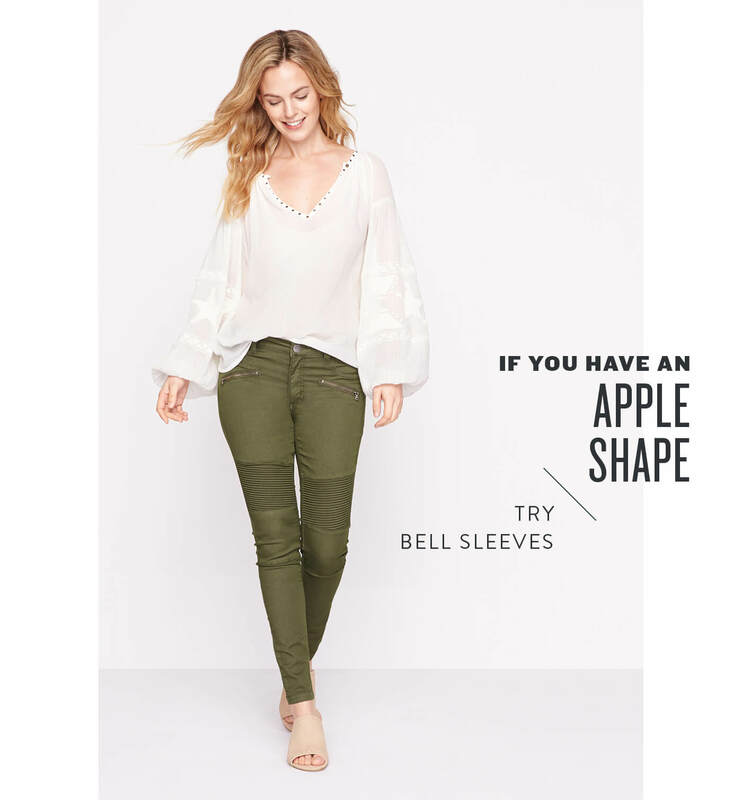 Apple frames tend to carry weight through their middle, so if you’re looking to cover up your midsection, look no further than this season’s plethora of flowy, unstructured styles—like boho-tunics and relaxed button-ups with dramatic sleeves. Why bell sleeves? This sassy new sleeve will add drama to any outfit! When paired with sleek skinny jeans—this combination helps balance out the top and bottom of your shape. If you’re looking to show off your collarbone, a blouse with a V-neck is best— it will draw the eye up from your torso to your face! You’d describe your body as curvy! Wear a fitted midi dress to show off your hourglass figure. 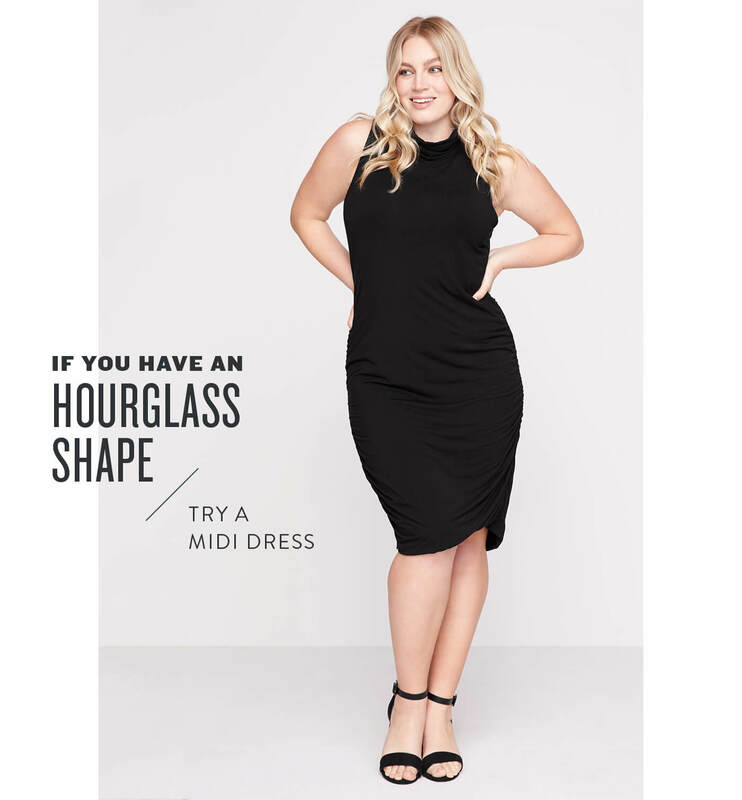 With a well-defined waistline, fuller hips and bust, the slim and sleek cut of a midi dress highlights all of these quintessential hourglass features. If you’re looking to accentuate your shape, look no further than pieces like: high-waisted jeans, anything with a wrap waist and flared denim. Why the fitted midi dress? This super streamlined silhouette will hit you in all the right places—and it’s extremely au courant. Skip the minis and the maxis this season (unless that’s your tried & true) and opt for this more forward hemline that will take you from BBQ to backyard wedding in style. You often need your clothing altered! Springs out, shift dresses out! Don’t be fooled (or freaked out!) by a shorter hemline, it’s the perfect opportunity to show off your gams and your leg line, all while creating a streamlined silhouette. If you can’t wait to show off your shoulders, go for a sleeveless shift, but if you want to stay more covered up, try a bell-sleeved shift for an on-trend take on spring dressing. 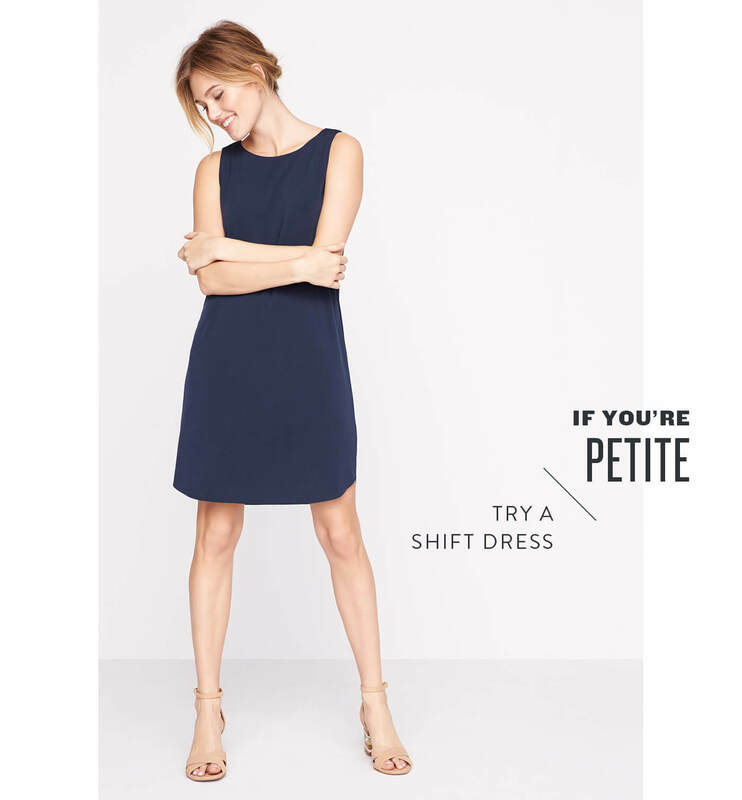 Why the shift dress? A shift dress that hits mid-thigh is perfect for petite frames because it creates a continuous line from your shoulders to your ankles, plus shows off a lot of leg. If you want to define your waist, try a belt or tie a denim jacket or button-up shirt above your hips. Just add sneakers for a cool-girl vibe. Take your balanced frame up a notch with a pair of slim, straight leg jeans. If you have an athletic frame, a straight leg lengthens the leg without being too snug. Make it business on the top with a trim and tailored blazer, then have a party on the bottom with slightly distressed denim. Why the straight leg jean? 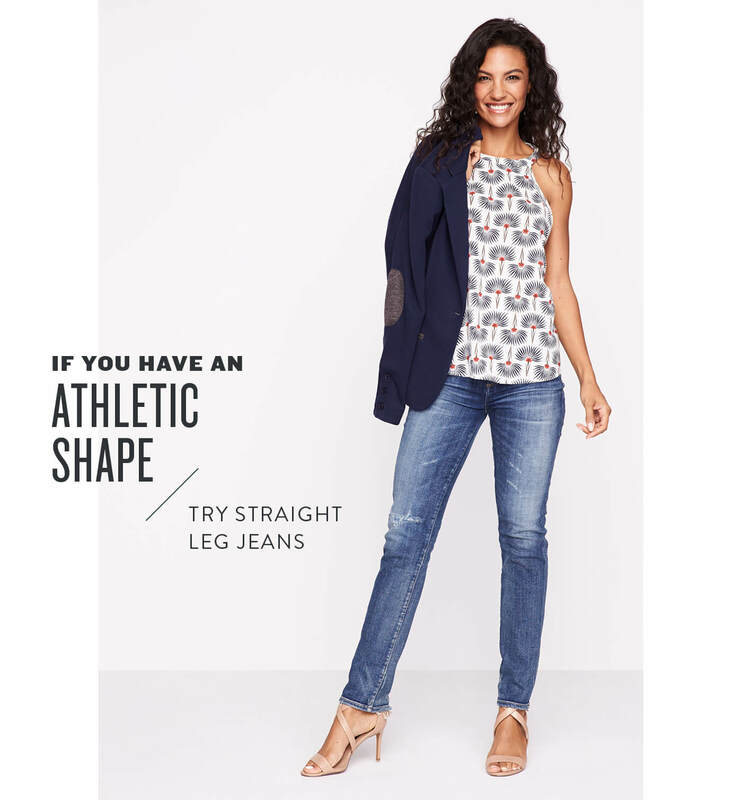 Straight leg jeans are the perfect pair to reach for as an athletic shape. With your more-muscular thighs and straighter silhouette, a wider leg (compared to a skinny jean) will slim your leg-line and add om-worthy balance to your shape. Everybody and every body is different, these examples are just a starting point! And, we want to hear from you. We believe that the best place to get the lowdown on how to dress your body is from real women. From dishing on how to find the best jeans for petite, to understanding how to dress your curves—hear from all shapes & sizes in our series: My Body, My Style. Want to know more? Ask a Stylist for tips & tricks for your shape and get a personalized response!